What is Heal N Soothe? Heal-n-Soothe is made from a combination of ingredients known to help reduce inflammation in the body and provide antioxidant protection. As most people know, inflammation of the joints is the primary reason pain occurs with conditions like rheumatoid arthritis and osteoarthritis. With this product, inflammation is reduced by increasing proteolytic enzymes in the body and removing free radicals. Proteolytic enzymes function by inhibiting the process of inflammation, thereby reducing it not only in the joints but throughout the whole body. With reduced inflammation, nerve irritation will also decrease leading to reduced pain sensation. Being an antioxidant, this joint pain formula facilitates the removal of free radicals in the body that cause damage to the joints, cartilage, tendons, and synovial membranes. Who is the Manufacturer of Heal N Soothe? This product is manufactured by the National Enzyme Company, one of the market’s leading supplement manufacturers. They specialize in producing patented products which contain natural enzymes. However, the distribution of this product is by Living Well Nutraceuticals and it is sold on their official website and also other leading online retailers. They provide free trials of the product and offer a money back guarantee on all purchases. How Does Heal N Soothe Work? The scientific information on the ingredients shows they could have a positive effect on supporting a reduction in joint pain and inflammation. Heal N Soothe Ingredients – Are they Safe & Effective? This product has a high concentration of natural enzymes. It works by reducing the inflammation through neutralization of the bio-chemicals. They reduce it to levels where regeneration and repair of the injured tissues can take place. What are the Advantages of Heal N Soothe? What are the Disadvantages of Heal N Soothe? 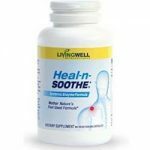 How Should You take Heal N Soothe? Take Heal N Soothe at least once per day, but do not exceed three times a day. For best results, take it 30 minutes before a meal or 60 minutes after the meal. The manufacturer is not specific about how long it takes to see results although it is said to be fast-acting. However, results will depend largely on the severity of the joint pain. Individuals on any medication should consult their physician before taking this supplement. It should be taken with caution by pregnant and nursing females and those with allergies to any of the formula ingredients. Does Heal-n-Soothe contain Animal Derivatives? No, Heal-n-Soothe doesn’t contain any animal derivatives. There are a number of positive customer reviews for this product with many consumers stating that it worked well for relieving their painful joints. Because there is a free trial period, consumers are able to try the product and see how well it works for them, with no financial risk. However, they should be aware that by ordering the trial they will be enrolled into the auto-billing program and continue receiving the product at a cost of $59.00 per bottle unless they cancel. Before making a decision about this product, it is wise to look at other joint supplements reviews to explore more options on the market. Pain free movement is vital to our well-being and joint damage can prevent you from doing the things you once loved. Many conditions lead to joint pain from aging to an untreated sports injury. A quality joint product may help repair existing tissue damage and also promote stronger joints that are less susceptible to future degeneration. It’s not just called “Heal-n-soothe” for no reason. Those who have used this formula can relate better. It works its magic on the joints and maintains sanity within the whole body. It was like I hit the jackpot when I started noticing changes in my joints, body in general. I couldn’t believe it (I do now). The supplement helped in reducing the swellings in my joints and also worked against future ones. Usually, the swellings come and go I’ve not had one joint swelling in six months. I strongly recommend it for people out there who have joint pains as well as body pains. I used to use a different product that worked really well. For reasons I can’t understand, that product has been discontinued. That brought me to Heal n Soothe. I thought it might work for me. I have been using it for several weeks now and I’m not seeing or feeling the results I want. I don’t think I’ll be buying it again unless it starts to reduce my pain. I type all day long and as a result, I get a lot of joint pain in my hands. Some days are worse than others. I was using a prescription gel I got from my doctor and it was helping, but due to insurance changes, I can no longer get it, so I was looking for something different. I decided to try Heal n Soothe. I’ve been using it for weeks and I still have my joint pain. I don’t think it works. Heal-n-Soothe have been bad for my health. I was sure the product would minimize my severe joint inflammation resulting from my osteoarthritis condition. However, it has been nothing but a menace. It has not eased the pain in the joints and it actually caused skin irritation. So now, I not only have painful joints, but my skin is all red and sore too! I feel really cheated as the information I read claimed that it would work really quickly and it’s done nothing. It hasn’t healed and it certainly hasn’t soothed! What a waste of money. I’m a 53-year old man who has suffered from arthritis in my shoulders for several years. I worked for a moving company for 10 years, and all the heavy lifting for all those years contributed greatly to my condition. I’ve tried numerous pills and creams and other types of treatments, and I still haven’t found the ideal one for me yet. Heal N Soothe was no exception to this. I took these supplements every day for 2 months, and they did almost nothing for my pain and swelling. I wouldn’t recommend this product at all! I have osteoarthritis and it has hampered me tremendously because I used to be a very active person. I enjoyed taking my dogs on long walks and strolling on the beach whenever I wanted. Now I have to cut walks with my dogs short and I have to make sure the weather is just right before I go walking on the beach. What Heal N Soothe has done for me goes way beyond antioxidant defense. It has given me my way of life back. I can be as active as I want to be. Online order was a scam ! I ordered a sample pack and 1 extract bottle online, paid £57. But never received it, and My money was not refunded. All efforts made to get my money back or the supplement failed. So be careful ordering from them! 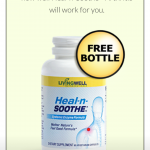 I have received a first bottle of Heal-n-Soothe and later cancelled the auto delivery of the second one. Now I want to order one more bottle but not on an auto delivery system. That may come but I want to try another bottle and make up my mind on my own. question is where can I do this.